James Cecil Dickens (December 19, 1920 – January 2, 2015), better known by his stage name, Little Jimmy Dickens, was an American country music singer and songwriter famous for his humorous novelty songs, his small size (4'11" [150 cm]), and his rhinestone-studded outfits (which he is given credit for introducing into country music live performances). He started as a member of the Grand Ole Opry in 1948 and was inducted into the Country Music Hall of Fame in 1983. Before his death he was the oldest living member of the Grand Ole Opry. Dickens was born in Bolt, West Virginia. He began his musical career in the late 1930s, performing on radio station WJLS in Beckley, West Virginia, while attending West Virginia University. He soon quit school to pursue a full-time music career, traveling the country performing on local radio stations under the name "Jimmy the Kid." In 1948, Dickens was heard performing on WKNX, a radio station in Saginaw, Michigan while on location at Buck Lake Ranch, Angola Indiana. Roy Acuff introduced him to Art Satherly at Columbia Records and officials from the Grand Ole Opry. Dickens signed with Columbia in September and joined the Opry in August. Around this time he began using the nickname Little Jimmy Dickens, inspired by his short stature. Dickens recorded many novelty songs for Columbia, including "Country Boy", "A-Sleeping at the Foot of the Bed", and "I'm Little but I'm Loud". His song "Take an Old Cold Tater (And Wait)" inspired Hank Williams to nickname him Tater. Later, telling Dickens he needed a hit, Williams wrote "Hey Good Lookin'" in only 20 minutes while on a plane with Dickens, Minnie Pearl, and Pearl's husband, Henry Cannon. A week later Williams recorded the song himself, jokingly telling Dickens, "That song's too good for you!" In 1962, Dickens had his first top-10 country hit since 1954 with "The Violet and the Rose". In 1964, he became the first country artist to circle the globe while on tour. He also made numerous appearances on television, including on The Tonight Show Starring Johnny Carson. In 1965, he released his biggest hit, "May the Bird of Paradise Fly Up Your Nose", which reached number 1 on the country chart and number 15 on the pop chart. Dickens joined the producers Randall Franks and Alan Autry for the In the Heat of the Night cast CD Christmas Time’s A Comin’, performing "Jingle Bells" with the cast (the CD was released by Sonlite and MGM/UA and was one of the most popular Christmas releases of 1991 and 1992 with Southern retailers). Toward the end of his life, Dickens made appearances in a number of music videos by the country musician and West Virginia native Brad Paisley. He was also featured on several of Paisley's albums in bonus comedy tracks, along with other Opry mainstays such as George Jones and Bill Anderson. They were collectively referred to as the Kung-Pao Buckaroos. 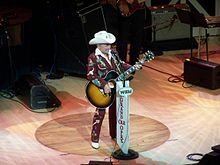 With the death of Hank Locklin in March 2009, Dickens became the oldest living member of the Grand Ole Opry, at the age of 90. He made regular appearances as a host at the Opry, often with the self-deprecating joke that he is also known as "Willie Nelson after taxes," playing on his resemblance to Nelson in his later years, Nelson's highly publicized problems with the Internal Revenue Service, and Dickens's own short stature. At the 2011 CMA Awards, Dickens was dressed as Justin Bieber and made fun of Bieber's current paternity scandal. Dickens married Connie Chapman in 1944, the marriage ended in divorce in 1955. Later that year, he married Ernestine Jones; she died in 1968 in an automobile accident while traveling in Texas. He married Mona Evans in 1971. Notes A^ "May the Bird of Paradise Fly Up Your Nose" also peaked at number 4 on the Canadian RPM Top Singles Chart. ^ a b "BBC News – Country star Little Jimmy Dickens dies aged 94". BBC News. Retrieved January 5, 2015. ^ Khatchatourian, Maane. "Little Jimmy Dickens, Oldest Grand Ole Opry Star, Dies at 94". Variety. Retrieved January 3, 2015. ^ "Little Jimmy Dickens, Oldest Grand Ole Opry Cast Member, Dead at 94". Associated Press via Billboard. Retrieved January 3, 2015. ^ Mansfield, Brian. "Country Great "Little" Jimmy Dickens Dies at 94". USA Today. Retrieved January 3, 2015. ^ Masino, Susan (2011). Family Tradition: Three Generations of Hank Williams. Montclair, New Jersey: Backbeat Books. p. 67. ISBN 978-1-61713-006-9. ^ Lavallee, Michelle. "Little Jimmy Dickens: Country Singer to Opry Legend". AXS. Retrieved January 3, 2015. ^ "Artists : Artists A to Z : Little Jimmy Dickens Biography : Great American Country". Archived from the original on January 3, 2015. Retrieved January 5, 2015. ^ "Farewell to 'Little' Jimmy Dickens". uDiscovermusic.com. Retrieved January 5, 2015. ^ "Little Jimmy Dickens' December Filled with Milestones". BrentwoodHomePage.com. Archived from the original on January 3, 2015. Retrieved January 5, 2015. ^ "Grand Ole Opry Stars Little Jimmy Dickens and Darrell McCall At Llano Country Opry: Events". Mason County News. May 15, 2010. Archived from the original on January 4, 2015. Retrieved January 5, 2015. ^ "Little Jimmy Dickens". CountryMusicHallofFame.org. Retrieved January 5, 2015. ^ Cooper, Peter (January 3, 2015). "Little Jimmy Dickens, beloved 'Opry' star, dies at 94". The Tennessean. Retrieved January 3, 2015. ^ "Little Jimmy Dickens Has Died at the Age of 94". PEOPLE.com. Retrieved January 5, 2015. ^ "Little Jimmy Dickens' Funeral Held At Grand Ole Opry". NewsChannel5.com. Archived from the original on January 9, 2015. Retrieved January 8, 2015. ^ Cooke, Sherryjane (January 8, 2015). "Little Jimmy Dickens Passes Away at 94; His Life, Death and Legacy". AXS.com. Retrieved January 1, 2017. This page is based on the Wikipedia article Little Jimmy Dickens; it is used under the Creative Commons Attribution-ShareAlike 3.0 Unported License (CC-BY-SA). You may redistribute it, verbatim or modified, providing that you comply with the terms of the CC-BY-SA.